Fifty people all over sixty-five years old, from all over the world are featured in this glorious book by Andrew Zuckerman. His photos are truly "in your face", or should I say, "in their face" as he really gets up close and personal. 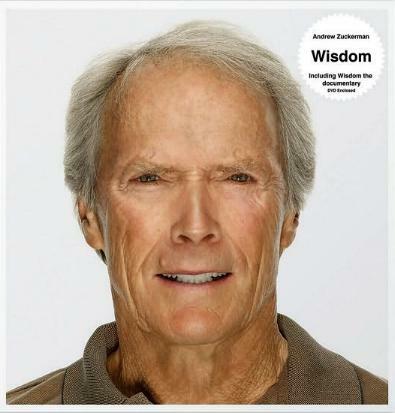 His book not only has fantastic photographs but also poignant words of wisdom by his illustrious subjects, who include among others, Buzz Aldrin, Václav Havel, Bill Withers, Jane Goodall, Kris Kristofferson, Nick Nolte, Jacques Pépin, Ravi Shankar, and Nelson Mandela. They also include the likes of actors, architects, politicians, religious leaders, cooks, designers, musicians, painters, writers, and more. Each person featured offers their words of wisdom, which was what Andrew Zuckerman had in mind — one generation passing down the "wisdom it has gained from experience". There are many whose words are resounding, moving, infectious, and appropriate — Dave Brubeck is one. Some have a lot to say, others are short and to the point. Willy Nelson has a point. Some of my favorite people featured are: writer Rosamunde Pilcher (love her books), Judi Dench, and Nelson Mandela. I loved this line from Alan Arkin: "My focus, my belief is that if people clean up their own act spiritually, for want of a better term, you automatically have a profound effect on the world around you". See my review of Zuckerman's book, Bird. Conclusion - Beautiful pictures, moving and insightful thoughts, and many great lessons to take away.